An email hack of Sony Pictures - possibly by North Korea and/or the group "Guardians of Peace" for what may be a retaliation for the content/plot of film, "The Interview" - a fictitious comedy starring Seth Rogen and James Franco about two reporters recruited by the CIA to kill North Korean Leader Kim Jong-un - led to many leaked emails which, of course, were very embarrassing. In one email, producer Scott Rudin referred to Angelina Jolie as, "a minimally talented spoiled brat" in his discussions with Amy Pascal - Sony Pictures co-chairman. 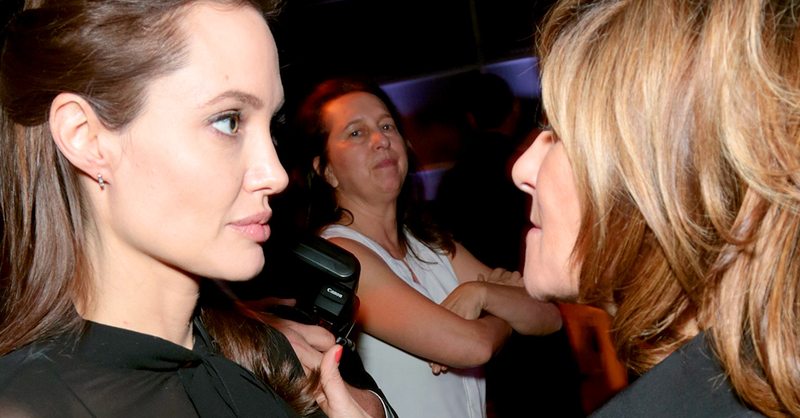 The above image (wider view below) captures a very awkward accidental meeting between Angelina Jolie and Amy Pascal after an industry breakfast Wednesday morning. In this moment we several very noteworthy nonverbal signals. Note Jolie's widely open eyelids. With higher levels of anger (rage) human eyes are open very widely. With lesser anger (mild to moderate amounts), the eyes are partially closed with considerably tightened eyelids. Angelina Jolie is also leaning considerably backwards in this moment, not feeling very warm and fuzzy to a person who thinks so little of her. Pascal's lips are trying to minimize an outward display of greater emotion as well as an inward crescendo of her emotions - by configuring in what is known as an "Inward Lip Roll" (ILR). Inward lip rolls are seen more often with negative emotions, but they may also occur in the suppression of laughter and joy in socially out-of-context scenarios. Although this is a still frame and not a video, it is very notable also that Pascal's thumbs are not touching Angelina's arms/shoulders. This distancing phenomenon is another signal that Amy Pascal does not really want to speak with or see, let alone embrace Jolie. What two emotions are being felt by the woman in the background?